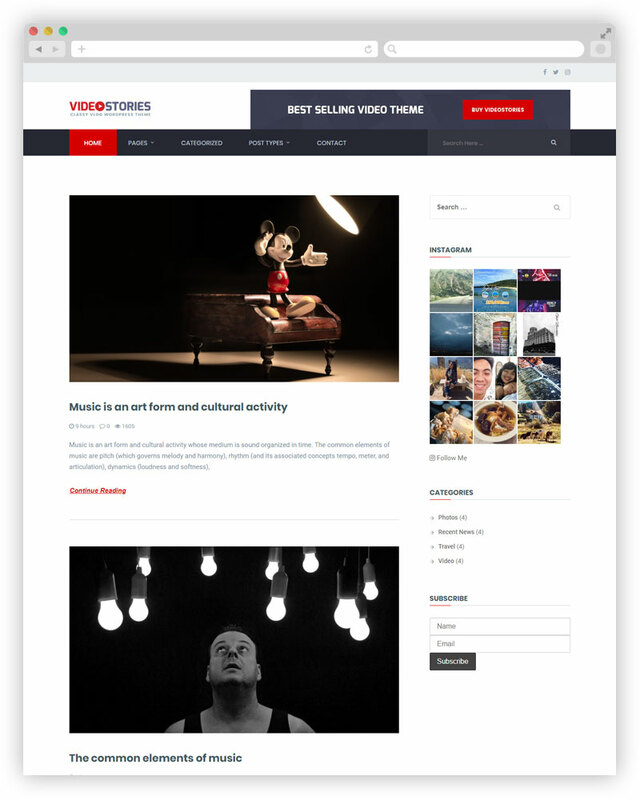 Videostories is a free Blogging Theme suits any type niche. There are a lot of user who use it for personal blogging. No matter what type of blog you are going to run. But it can be a winning choice for your next project. No complex Theme option. Everything is easy and will happen in front of your eye. You should customize the Theme from WordPress customizer. After activating the Theme just visit WP Admin > Appearance > Customize. Change Logo, Header Ads, Different Widgets, Footer, Sidebar from this option. Videos always express everything more then text. That’s why we have built a customization video for this Free Theme. Try the Theme yourself and see the magic. 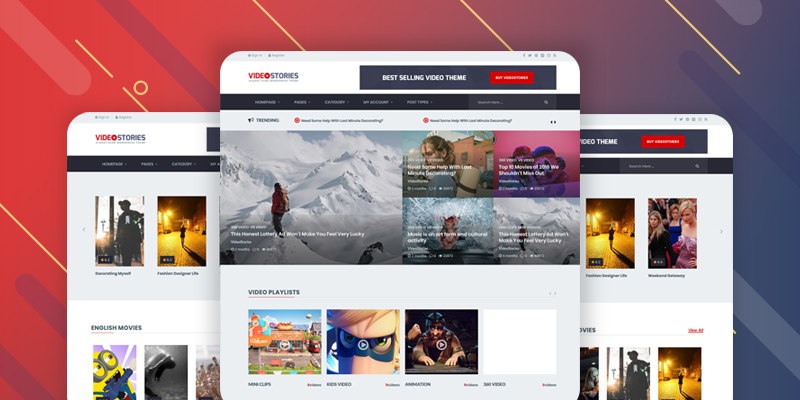 Free Download VideoStories Download VideoStories Pro Check some other cool features in details: Adapt With Any Device: Responsive layout adjust with any type of modern device and browser. Being responsive design is a most necessary aspects for websites. We need to make things that are perfect for users. Without responsive it’s hard to read blog post or page. Header Add: We have added standard header ads system in this Theme. This can be managed from widget option. You can upload custom image as header ads or put any code (Google adsence, Amazon) too. Professional Footer: Amazing 4 column footer layout. These column are enough to showcase necessary stuff. By default we have added About, Category, Recent Post and Subscribe in our demo. Recommend Plugins: We have arranged the demo with some plugin to add Subscribe Form, Instagram Feed. 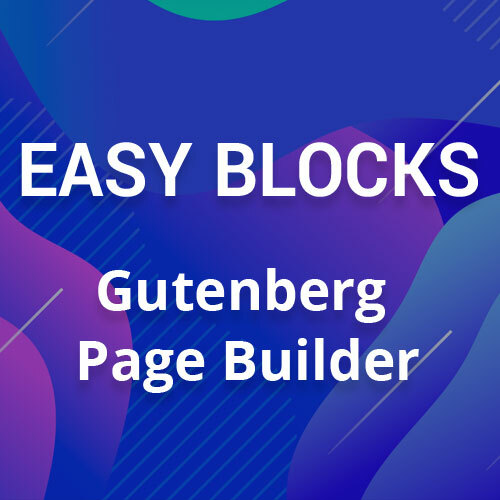 If you want to add Subscribe and Instagram in the Sidebar or Footer, you should install and active the following Plugins. Top Bar Social Icon: We have added option for Top Bar social media URL. Note down Facebook, Twitter, Instagram, Dribble, Vimeo, Skype account and place them in the filed. Don’t forget to save it. Social icons are necessary to get focused on social profiles and blog at a same time. Contact Form 7 Compatible: We have added a good looking style for the contact form. Contact form 7 plugin should be installed first to create form. Download it wordpress.org/plugins/contact-form-7 That’s all for the Free videostories Theme review. If you have any suggestion or problem on using this Theme, feel free to contact us anytime or comment bellow.